Copyright 2019 © MuscleXP, a Brand of Emmbros Overseas. All Rights Reserved. 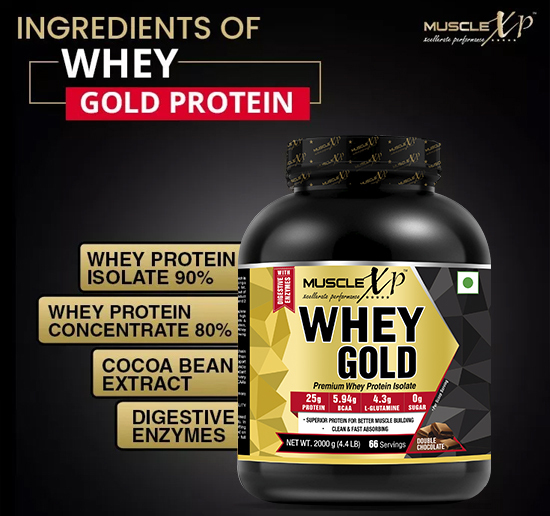 MuscleXP Whey Gold Protein is a high-quality macronutrient protein product that is enriched with naturally occurring amino acids which our body requires every day. This product provides 112.80 kcal Energy, 25g Protein and 0.40g Fat per 30-gram serving. MuscleXP Whey Gold Protein is a highly trusted supplement for bodybuilding and fitness. Also, It has no sugar and is available in delicious double chocolate flavour. 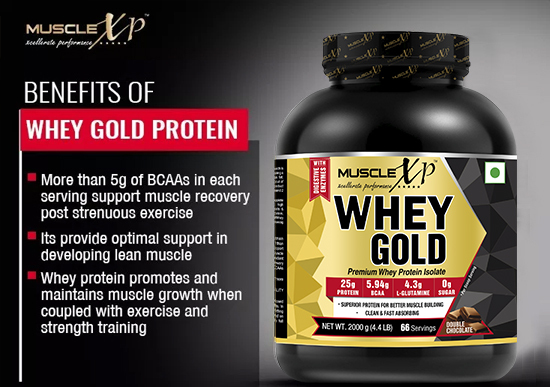 MuscleXP Whey Gold Protein is enriched with Potassium, Sodium, Calcium and Amino Acids. It has high nutritional value and is one of the best dietary sources of high-quality protein. The ultra-filtered whey in the product ensures less fat, cholesterol, and sodium. MuscleXP ingredients are sourced from the USA and produced in a World Class Facility with International Manufacturing Standards (ISO 14001: 2004 from TUE-SUD, Germany, WHO GMP, ISO 22000- 2005 from TUV-SUD, Germany, National Sanitation Foundation – USA). The product does not contain banned substances. The premium quality natural flavoured supplement helps improve immunity and provides required nourishment, stamina and strength supporting the body to cope with strenuous physical activities. Whey protein promotes and maintains muscle growth when coupled with exercise and strength training. Whey protein concentrate (WPC) is known to have potent antioxidant properties. In one of the studies, the effects of the WPC on redox homeostasis was evaluated. It was found that WPC affects the redox balance in salivary glands and stimulates antioxidant mechanisms. .
1. WHEN CAN I TAKE MUSCLEXP WHEY GOLD PROTEIN? You can supercharge your diet by taking MuscleXP Whey Protein in your breakfast or immediately after your exercise. During breakfast time your body is ready to take in the good amount of nutrients while after an intense workout, muscles are responsive to amino acids in the diet. 2. WILL MUSCLEXP WHEY PROTEIN MAKE ME FAT IN CASE I DON’T WORK OUT REGULARLY? Whey protein is a supplement and typically consists of more protein along with small amounts of fat and carbohydrates. Our body needs a lot of energy to digest protein and protein is considered to be the building blocks of our body. Hence, whey protein intake is not believed to make anyone fat. Moreover, people who do not take enough protein in their diet can boost up their protein levels by incorporating whey protein in the diet. If you exercise daily, then whey protein could help in muscle recovery, thereby helping in developing a sculpted and lean look. Whey Protein Isolate, Cocoa Powder, Inulin, Potassium Chloride, Thickeners (INS 466 & INS 415), Sodium Chloride, Calcium Phosphate Dibasic, Sweetener (INS 955), Thickener (INS 407) & DigeZyme. This whey protein isolate makes delicious chocolate flavored protein shakes. Didn’t experience any digestion issue after taking it. Perfect post workout shake. Premium whey protein for post workout muscle recovery and restoring energy level. Tastes good. This whey isolate is my favorite protein powder. Perfect component of a high protein diet. It tastes delicious and is easy to digest. Add one scoop of Muscle XP Whey Gold Protein to a glass of (200 ml) of water, low-fat milk or any of your favorite beverage. Mix it thoroughly with a spoon until the powder dissolves completely. Tip: For a strong flavour, you can mix one scoop of powder in 150 ml of water, milk or any beverage. For a mild tasting flavour use one scoop in 275 ml of liquid. MuscleXP Instantized BCAA 6000 aids the body and recovers muscle as well as reduces muscle breakdown. It contains 6gms of BCAA, with L-Leucine to L-Isoleucine and L-Valine in the ratios of 2:1:1. Additionally it contains 500mg of Taurine and L-Alanine. Each of the contents, work in their capacity towards enabling an enhanced performance, quicker recovery and stronger immune system. The 400 g pack, easily serves 44 servings of 9 gms each and every serving of the product is power packed. This product is available in the delicious orange flavour and mixes easily. MuscleXp Micronized Creatine Monohydrate Powder is highly valued by fitness experts around the world. This Product helps to enhance the strength of the body’s vital muscles and is known to encourage the muscles to grow to their fullest and function at their greatest efficiency level. This Micronized Creatine Monohydrate Powder enables a person to cope with extreme weight training and stamina activities, enabling its users to push harder, move faster, as well to recover at a far quicker rate than usual. Creatine Monohydrate has also been known to delay fatigue, which enables its users to push their workouts to the extreme limits. PROTEIN POWER: MuscleXP Mass Gainer packs in ample protein power to help you gain muscle mass. It combines Whey Protein and Carbohydrates the helps fuel intense workouts and maximize recovery. VITAMINS FOR STAMINA: Twenty-six essential vitamins and minerals fortify our superlative mass gainer to cover all aspects of sports and physical training performance, that help from boosting energy to fighting fatigue and protecting cells from free radicals. GLUTAMINE FOR MUSCLES: L-Glutamine and other essential and non-essential amino acids help minimize muscle breakdown and improve protein metabolism. CALORIE CHARGE: One heaped scoop of our mass gainer weighs approximately 75gm, which has 57gm of carbohydrates, 11gm of premium protein, 1gm of fat and dietary fiber each, 100mg of L-Glutamine and 150mg of Inositol. Together they power you up with 283 kilo calories. DIGEZYME SUPPORT:This mass gainer contains DigeZyme, a proprietary multi-enzyme complex that helps in digestion and absorption of proteins, vitamins, fats and carbs in the body. CHOCOLATE FLAVOUR: Our research team has worked with top protein-flavouring professionals in the world to come up with a best-in-class, mouth-watering double chocolate flavour. MuscleXP 100% Whey Protein is a high-class macronutrient protein formula that contains elevated quantities of natural amino acids that are required by the body on a daily basis. Whey Protein is a vital part of any nutrition routine, that acts as a catalyst for the body to help with protein synthesis as well as muscle growth. Its superior formula gives your body the unadulterated, safe high-quality protein that you require to fuel muscles. This aids muscle recovery. This MuscleXP 100% Whey Protein is one of the best protein supplements available in the market. HEALTHY WEIGHT GAINER: MuscleXP Weight Gainer supports weight gain by providing vital nutrients to your body. PROTEIN TRI-BLEND: Our supplement has a smashing tri-blend of Whey Protein, Soya Protein Isolate, and Skimmed Milk Powder to supply the important muscle-building amino acids. FORTIFYING VITAMINS & MINERALS: Twenty-five essential vitamins and minerals fortify this supplement and aid in gaining weight, enhancing performance, fighting fatigue, boosting energy, and protecting cells from free radicals. FATS AND CARBS: Fats and Carbohydrates are crucial to any weight gain regimen. Fats are known to play an important role in the production of hormones and building cells walls, while carbohydrates provide the muscles with fuel for heavy training or workouts. CALORIE COUNT: One heaping scoop of this supplement weighs approximately 75gm, which has around 52gm of carbohydrates, 11gm of protein, 4gm of fat, 2gm of dietary fiber and 6gm of sugar. It powers you up with 292 kilocalories. DIGEZYME SUPPORT: Our supplement contains DigeZyme, a proprietary blend of five digestive enzymes which support better digestion and absorption of weight enhancing nutrients in the body to give you the best results. YUMMY TASTE: A double chocolate flavor makes this supplement not just a weight-gain booster, but a yummy treat to the palate as well. THE ORIGINAL ANYTIME ENERGY MIX – MuscleXP Amino Blend + Energy Powder combines an optimal ratio of rapidly absorbed free form amino acids (including BCAAs and arginine), as well as beta alanine and caffeine to help you reach your next level. Mix up ESSENTIAL AMINO ACIDS + ELECTROLYTES + CAFFEINE anytime you want a boost of amino acids for muscle supports and electrolytes to help replace what’s lost through sweat. Muscle Recovery – BCAAs help muscle protein synthesis & nitrogen retention that support lean muscle growth/preservation from training; May increase muscle recovery. Energy and Focus – Featuring a precise dose of Caffeine with Green Tea & Green Coffee that helps boost energy, focus and intensity. When you have a glass of MuscleXP Amino Blend + Energy instead of a cup of coffee, you get natural caffeine, 250 ml of water, plus a plethora of amino acids to set you up for the day. MuscleXP Pro Mass Gainer is a thoughtfully concocted powder that has more proteins, better calories. A perfect choice for all athletes and bodybuilders who want to build mass and increase strength without collecting extra fat. Additionally, it has an ideal macronutrient profile which is a tried and tested formula for building muscle and increasing strength. Rich in proteins and loaded with calories, this product is pure Veg and ensured you better results. MuscleXP BCAA Energy is an advanced formula enriched with caffeine, micronized BCAAs, L Glutamine, and L Citrulline. BCAAs support muscle growth and also help maintain lean muscle mass. Citrulline is a powerful nitric oxide booster, that might help to elevate the energy level and delay the onset of fatigue. Available in orange flavour this product is stimulant-free and Hence, can be used anytime. MuscleXP 100% Whey Protein New Gold is capable of providing an exceptionally-high quality macronutrient protein formula that is full of naturally derived amino acids that the human body requires on a daily basis. This product is devoid of banned constituents, aiding in the provision of peace of mind due to its top quality product formulation. Every serving can be mixed promptly with the help of a blender, mixer, or even with a spoon – it is incredibly smooth, which makes it an easy job that can be done on the go. The company’s experts have come up with an advanced whey protein formula which is not only able to help provide muscle-developing outcomes, but each flavour comes with a gratifying, appetizing, lip-smacking taste range. MuscleXP Complete Protein & Vitamin Shake Mix is an apt way of getting the required nutrients. This shake mix is made from milk proteins, whey and soy proteins. MuscleXP Complete Protein & Vitamin Shake Mix contains ZERO sugar with 0.3g fat in each serving. This product is perfect for those who are looking for a nutrition-rich exercise accompaniment for their daily exercise. We are secured by 128 bit SSL making your shopping at MuscleXP as secure. Copyright 2019 © Musclexp.com All Rights Reserved.